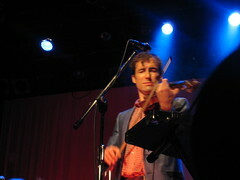 “I’ve got a lot of songs for you,” Andrew Bird said halfway through his nearly two-hour set. “That’s my way of saying it’s going to be a long show.” The packed audience at Milwaukee’s Pabst Theatre didn’t seem to mind, though, and probably would have stayed all night, waiting to see what Bird would come up with next. Bird powered through a set of 20 songs, drawing primarily from his last three releases. The show started out, after an extended, intense instrumental intro (referred to as simply “Ravel” on the set list, it seems to have evolved from an homage to Ravel’s String Quartet), leading into “Fiery Crash”, and the energy didn’t let up all the way to his now-traditional show closer of “Fake Palindromes”, even through slower songs. He was incredibly at ease, despite being under the weather (as he has been for much of the tour). I’ve been up front for several Bird shows now and I can comfortably say that ths is the most eye contact I’ve seen him make and hold with the audience. He looked like he was genuinely enjoying himself, all smiles, jokes, and laughter the whole night. Constantly checking in with the audience — are we all okay? are we enjoying ourselves? — Bird pointed out that he needed to worry about us so that he could take his mind off of himself, given that the show was being filmed for a future DVD release. “So just act natural,” he told us. The show was, as always, one song after another of epic. An early highlight was “Opposite Day”, early in the set. It’s a fantastic song that takes on a new energy when performed live (as many of Bird’s songs from The Mysterious Production of Eggs seem to do), and one that I’m always glad to see on a setlist. But this rendition was even more special: there’s a tag ending on the recording that I really love — the part that starts with”but if you think there’s something else, well you’re right, there is” — but I haven’t heard that on a live recording since around when Eggs was released, and I figured that he’d just decided that he didn’t like it in the song anymore. Well, that ending came back, and I can assure you that I let out a gigantic scream at the end of it. It was perhaps the best surprise I could have imagined. While discussing the DVD, and his lingering illness, Bird mentioned that he’s trying to come up with a name for the release. Most of the suggested names happened to revolve around said illness. My personal favorites? “Mr. Bird Has a Fever” and “The Giant of Ill”. If that clip makes it onto the DVD, I’ll be the one letting out a giant peal of laughter at that one. While he might have been encouraging all of us to act natural, Bird didn’t mind playing fast and loose with his songs. After omitting the final chord of “A Nervous Tic Motion of the Head to the Left” — you know, the one that tells you when the song’s over — Bird grinned slyly at the audience. “I wanted to capture how perilous this show can be,” he said. 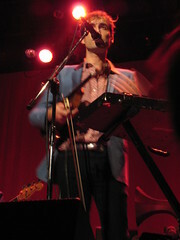 Several songs later, Bird threw a new song into the setlist, which he’s calling “Lusitania”. It’s been making appearances this summer, but it was the first time that I saw it live. He even broke out a new guitar for it, a shiny red one. I don’t know much about guitars, but it looks similar to the one he usually plays, only red. “Lusitania” contains the repeated line of “go ahead, say something dumb, boy, there’s no shame.” I’ll be sure to remember that if I have the good fortune to meet Bird again, as I’ll probably proceed to say something idiotic. “Lusitania” was followed by an extended instrumental break (called “Afro Jam” on the set list), which really felt like something more closely aligned with his Bowl of Fire days, with a raw, unbridled energy which is sometimes missing from his more introspective solo work. Of course, going on behind all of this improvisation on stage was my favorite roadie (the one who looks like he’s straight out of a 70s movie)… playing the cowbell and dancing wildly with bassist Mike Lewis and guitarist Jeremy Ylviasaker. And there, in front of it all, Bird was playing away, eyes closed, seemingly oblivious to the gigantic in-joke flailing about behind him. Later, after the now familiar set of “Imitosis” and “Cataracts” (the latter of which wasn’t on the setlist), Bird launched into “Headsoak”, but there was something different. Bird stayed on guitar for the entire song, leaving Ylvisaker to pick up the violin parts with his guitar instead. I’m not sure how I feel about this change — I enjoy the quaint, near-country feel the violin brings to the song — but it was an interesting rendition (perilous, even), which was much appreciated. Not many musicians have the nerve to completely change songs like that. Bird closed out the show with “Scythian Empires” (where he encouraged us all to whistle along) and “Fake Palindromes”. Midway through the latter, he stopped. “Wait, wait,” he said, not for the first time that night, “I want it to be perfect.” Someone in the audience shouted out that we like it when it’s imperfect (because really, even an imperfect Andrew Bird show is still lightyears beyond a flawless show from many other musicians). Bird fumbled for words for a moment, then shrugged, hoisting his violin and starting all over again. 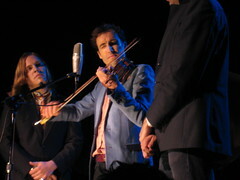 After a standing ovation and much applause, Bird and company returned to stage, gathering around a single microphone to perform the standard “Some of these Days”. There was another throwback to Bird’s earlier musical influences with a bit of an extended instrumental break in the middle, sounding far more like something he would have played in his early days, jazz and folk roots clearly evident. The final song was “Don’t Be Scared”, a cover of The Handsome Family to which Bird has given a life of its own. It’s hard to end any review of an Andrew Bird show with anything other than an announcement of it being the best show I’ve seen, period, but yet somehow, he always manages to top himself for one reason or another. He seemed to thrive in the Pabst, loving every moment of his perilous show, and the audience was right there with him, every step of the way. Bird plays again tonight, sans band, with St. Vincent opening. I can only guess at how amazing this show will be, and I’m crossing my fingers in hopes that they might just perform together. See the photoset on Flickr. Bird said he was ill in Cincinnati but said he felt there was something ‘special’ about it that he couldn’t pin down. And that shiny red guitar (which I believe is is an old Epiphone), he said he bought that day in Cincy and only used it on Headsoak. I’m so, so, so jealous you got to hear Don’t Be Scared as the closer. Was hoping for that one in Cincy. That is definitely my fav Bird song even though it’s not really his. I consider it his because of how he’s transformed it into his own. It’s so powerful. Can’t wait for the DVD. Did he really start over FP? Seems totally unlike him. You would never have known he was still feeling under the weather if he hadn’t mentioned it. It certainly didn’t affect his performing, that’s for sure. I was always sort of lukewarm about Don’t Be Scared on the album, until I saw him do it live earlier this year, and wow. Yeah, compared to the original, it might as well be a different song entirely. I’ve seen it live a couple of times now and it just gives me chills. He got right around to the first verse in FP before stopping — he stopped to re-tune, although I’m pretty sure he was the only one who heard any discrepancy.